Here is the ultimate overland adventure trip in the heart of Asia. Built by Chinese and Pakistani workers, this legendary road stretches from Kashgar in China to Abottabad in Pakistan. It offers 1300 km of pure trip excitement to overland travelers. All kinds of vehicles have passed this route, from bicycles to heavy motorcycles, from Volkswagen Beetles to large 4x4 trucks, even the famous Rotel bus has been there. The scenery along the road is of breathtaking beauty. Want to cross a big crystal-clear lake with small boats? A very large landslide changed the map of Hunza valley in 2010, about 30km of road got submerged, there is now only water. Till today they were not able to release the water of the "Attabad lake", now a chinese mega-project is on its way to circumvent the lake with tunnels. On the Chinese side the road already has an excellent standard, and with Chinese help the Pakistan side will be finished upgrading soon. At 4700m the KKH also offers the highest paved bordercrossing in the world. Take a deep breath! 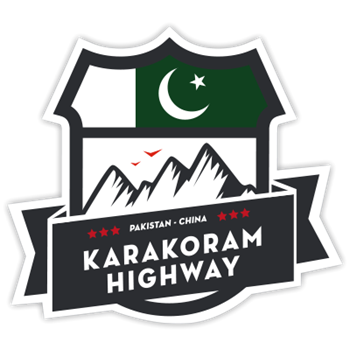 Complete your round the world tour traveling the Karakoram Highway, the advmotostickers.com achievement sticker will certainly get you the attention of people who know about this stunning ride.